TM 1-1520-240-10 4-3-12 Figure 4-3-10. 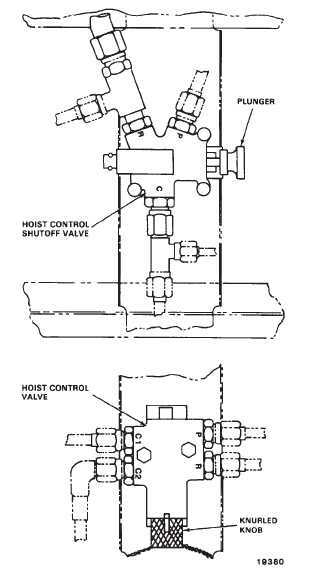 Hoist Control Valve and Hoist Control Shutoff Valve 4-3-4. Winching Accessories. Accessories are provided for winching and hoisting op- erations. Employment of these accessories is deter- mined by winch usage. A compartment bag is attached to the bulkhead wall above the winch for stowage of winching accessories. a. Cable Pulleys. A sufficient number of pulleys are provided to permit routing the winch cable for winching and hoisting operations. The pulleys are equipped with snap-lock fasteners for attachment to tiedown fittings or shackles as required. b. Cable Hook. A 2-ton-capacity removable hook is provided for use in winching and hoisting operations. Extending from the hook is a length of 1/4 inch cable, equipped with a metal ball which locks into a quick-dis- connect device that is used for attaching the hook to the cable. The full-swiveling hook contains a spring snap lock to prevent opening of the hook and accidental loss of cargo. c. Quick-Disconnect Device. The quick-discon- nect device permits rapid connecting and disconnecting of winch cable hooks. The device consists of a short length of steel with socket cavities at each end. The sockets are enclosed by spring-loaded rings that rest against flared rims in either edge of the device. The lock- rings are depressed to admit the ball ends of the cables into the sockets and snap into place when released, se- curing the ball ends of the cables in a positive connection. A guard is supplied with the quick-disconnect device. When installed, it prevents the hoist operator from inad- vertently operating the quick-disconnect device when assisting a rescued person into the helicopter. d. Cable cutter. In hoisting operations, there is al- ways a possibility that the cable hook might snag, result- ing in critical strain on the hoisting system and restriction of helicopter mobility. The cable cutter provides a means of quickly severing the snagged hook by cutting the cable. The cable cutter consists of a housing, two follow- er rollers that permit free travel of cable through the hous- ing, a cutting shell, a ballistic cartridge, and a threaded receptacle for electrical connector. The cutter housing is split to allow reeving the cable and is bolted to a pulley bracket through two holes in the housing. The cable cut- ter is armed by coupling an arming device to the recep- tacle in the cutter housing and plugging the device into the receptacle above the utility hatch marked CABLE CUTTER. The cable cutter cartridge is to be checked for total time prior to any hoisting or rescue operations. The cartridge should not be used after 8 years from date of manufacture and should also be replaced after 1 year of installed service life. Cartridges are considered over age when either limit is exceeded. WARNING If personnel are in the cargo compartment when a load is jettisoned, make sure that they remain aft of the rescue hatch and face away from the cable cutter. The hoist cable can whip forward when it is cut and particles can be ejected from the cable cutter.